Close To Restaurants, Short Distance To The Beach, Pool Just Down The Street! 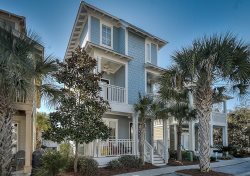 30 A Escapes presents: Beautiful "Blue Pearl", located in the Cottages of Eastern Lake neighborhood. This beautiful luxurious home awaits you, as does the close proximity to the sugar white sand and emerald green waters of the Gulf of Mexico. Clean white interiors highlighted by warm wood flooring and natural textures for a relaxing upscale vacation experience. A palm tree lined community pool is 100 yards away and the beach entrance is only a 4 minute bike ride away! Beach entrance features parking, a bike rack, and zero entry to the sand – no stairs! Community also features public park access to Eastern Lake for paddle boarding, fishing, kayaking, or YOLO boards. Complimentary use of a 6 seater golf cart and 4 bikes are available during your stay at Blue Pearl. This beautiful 4 bedroom 3 bath house boasts of two 1st floor king master en suites with walk in tiled showers and plenty of space. Sleep sound in the luxurious beds with plenty of crisp linens, and pillows. The second floor includes a guest room with a lovely queen bed, a Jack and Jill style bathroom with a tiled tub and shower combo, and another room that includes a set modern twin bunk beds. Enjoy complimentary cable, WiFi, a full gourmet kitchen with stainless steel appliances and granite counter tops. You can enjoy the screened in porch area or the lovely covered porch with curtains for privacy. Come enjoy the 30A experience of a lifetime! Seagrove Beach is known for its casual charm, upbeat ambiance, laid back all natural vibe. Its upscale boutiques, cafes and restaurants for any mood. Fall in love with the Blue Pearl and make lasting memories you will want to recapture years to come. Make this spectacular home your next stay on beautiful 30A! 3) 4 bikes are included in the rental. To utilize, waiver must be signed and received before code provided. Please contact Saxon with Bikes 4U at 850.399.1230 with any bike questions.